Thank God for Alain de Botton. For, without him, we might never have reflected that, behind each can of tuna stacked on the shelves of our local supermarket, there exists an intricate network of fishermen, factory workers, paper-pushers, airline pilots, lorry drivers, engineers and chemists whose interlocking contributions are essential if we are to be provided with the consumer products we take for granted. I daresay schools have stopped teaching such things, so the author is clearly performing a public service. Welcome to the world of work – to the ports, industrial zones and offices visited only by those who toil in them, though for the purposes of this volume they were joined by our intrepid author, who has recorded his exploits, together with some tangential musings, in a series of ten dazzlingly superficial essays, with accompanying photographs by Richard Baker. At one point, de Botton even takes off into bona-fide photo-essay territory, like a regular little Raymond Depardon. But it doesn’t last long. After the tuna, the writer dips into such mysteries as Biscuit Manufacture (my favourite chapter, if only for its Proustlike inventory of Ginger Nuts, Jaffa Cakes and Fox’s Chocolate Viennese) and career counselling in ‘an unassuming and cramped Victorian home in a run-down residential street in South London’ (in the accompanying photograph it looks like a regular semi-detached, though perhaps the author is unfamiliar with such housing). He hob-nobs with a fellow who has spent two years on a series of paintings of an oak tree in East Anglia, hooks up with a pylon enthusiast to follow one of the United Kingdom’s most important power lines from a nuclear power plant on the Kent coast to a substation in east London, and loiters in the offices of an accountancy firm in Southwark. And, as is his wont, he poses questions such as, ‘When does a job feel meaningful?’ He ponders the chasm between childhood dreams and adult reality, or the sort of career choices that result in people ‘spending twenty years specialising in the storage of flammable solvents or the reaction of wood pulp to water vapour’, or, prompted by the facial expression of a United Biscuits employee, dives into a detailed if only marginally relevant analysis of the painting New York Movie, by Edward Hopper. It’s rudimentary reportage with a dash of travel writer, delivered in a solemn style that reminded me of the heroine of Michael Arlen’s The Green Hat, who ‘did not like abbreviations, even lunch for luncheon.’ The facts and statistics are, in themselves, undeniably fascinating. I would gladly have read an entire volume dedicated to, say, the war between rival biscuit manufacturers, or to the Pylon Appreciation Society. If you edited out the waffle, this would make an excellent textbook for the aforementioned schools that have stopped teaching this stuff. 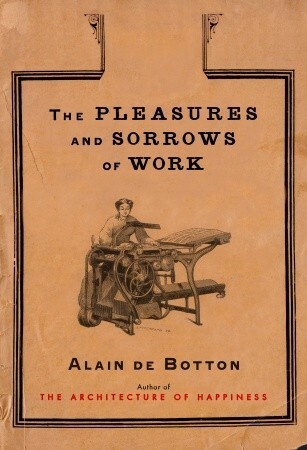 Unfortunately, the author cannot resist inserting himself into the narrative, and in a way that tells us more about him than his declared subject matter – which is fine and dandy if you are a de Botton fan, less so for the rest of us. He is a peripatetic dilettante, voyaging between a Maldivian fishing-boat and an airplane graveyard in the Mojave Desert, and many points in between, giving him opportunies aplenty to display his formidable erudition by quoting Ralph Waldo Emerson or Max Weber. He is like a precocious public schoolboy unleashed into the real world, describing his sojourn in a budget hotel near Le Bourget airport as though assuming we’re unfamiliar with such establishments, or intimidating the regular folk he meets (or possibly just boring them) with ruminations about the Industrial Revolution. One suspects he intended these encounters to be drolly self-deprecating, but they simply come across as smug. It’s a fairly painless read, requiring little intellectual engagement on our part and introducing no ideas we couldn’t conceivably have come up with on our own, given the leisure. But there’s an elephant in the room, and it’s this: one would perhaps be more likely to take seriously a book called The Pleasures and Sorrows of Work if its author had himself shown some evidence of ever having been engaged in some form of occupation that involved more than philosophical musing, swanning around art galleries or writing books in return for large advances. This review was first published in the Sunday Telegraph in 2009. That’s a very perceptive review! Rgds, Richard Baker.